At least 5 thousand faithful of Đăk Lâk parish and 3 thousand others in the Xê- Đăng parish were not allowed attend Christmas Day celebrations. The faithful denounce a "serious violation" of human rights and religious freedom. Priests are targeted as "unwelcome" by local Communist leaders. The area is inhabited mainly by tribal Montagnards. 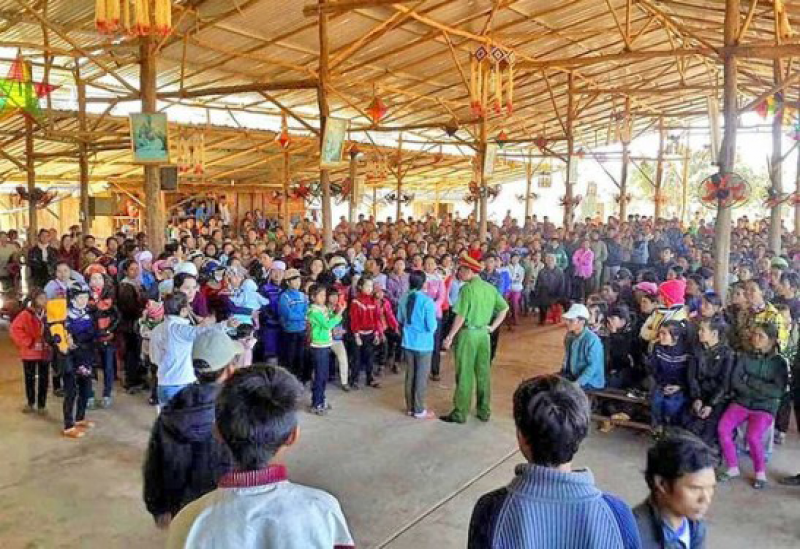 Hanoi (AsiaNews) - Christmas was banned in Vietnam’s Kontum (Central Highlands) province, where the authorities cancelled Christmas Mass celebrations in at least two parishes of the diocese, leaving thousands of expectant faithful astonished. The first parish involved was Đăk Lâk, in the municipality of Đăk Môn, Đăk Glei district, where there were about 5 thousand people. The second was Xê- Đăng, in the village of Kon Pia, district Tumơrôn, where more than 3 thousand people had gathered. It is home to a majority of Montagnards and tribal (Kinh, SE-Jang, Ho-lang and Jeh). Fr. Dominique Trần Văn Vũ, parochial vicar at Đăk Lâk, confirms that "the authorities of Kontum prevented priests from celebrating Christmas Mass" in these "remote and mountainous areas ". He speaks of attack on religious freedom, with the government authorities blocking the liturgies because celebrated by two priests in their view "unwelcome" who did not receive "prior approval." "For the government - he adds - we have no 'legal status' in society, we cannot celebrate and we must entrust all our functions to the bishop". The case of the banned Christmas celebrations in Kontum has been justified by a previous ban imposed on two priests. In recent days, the local People's Committee (composed of the Communist Party) sent a letter to the Bishop, announcing their intention to stop functions in areas inhabited by ethnic minorities. The authorities also invited the bishop "register" and "send a written request" in order to proceed in the future with the Masses, as well as send other "priests" to take the place of those deemed "unwelcome". Interviewed by AsiaNews Mrs. Theresa Hoa, of Đăk Lâk, confirms that "the authorities prevented the priests from saying mass" and that government officials "have thus violated the Constitution and the laws of Vietnam" that, in theory, guarantee religious freedom. An opinion shared by other parishioners, who denounce "serious human rights violations". The diocese includes the provinces of Kontum and Gialai, in the central highland of Vietnam, an area of ​​about 23 thousand square kilometers. Out of a population of about 2 million inhabitants, Catholics number almost 300 thousand, 16%. The population is made up of several ethnic groups, the majority the kinh. Extreme poverty and leprosy are still open wounds in society. The diocese can count on 70 priests, 347 religious men and women and 1,400 members of the Yao Phu Association, who carry out catechism and evangelization in the mountainous areas. A few months a new bishop Mgr. Aloisio Nguyễn Hùng Vi, was appointed. The Catholics of the diocese also face attacks on religious freedom, which are a constant against the Montagnard people and have soured in recent times. In early October, the former Bishop Michael Hoàng Duc Oanh wrote an open letter to local authorities against the decision of the provincial administration to demolish a house church in a small village located in a remote area of ​​the diocese. In addition, recently a district of the diocese has been the subject of the attack of the communist authorities, who have threatened to demolish 22 chapels used for services and prayers. Vietnam's 87 million people include 48 per cent Buddhists, more than 7 per cent Catholics, 5.6 per cent syncretistic and 20 per cent atheist. Conversely, religious freedom has steadily eroded in recent years. Under Decree 92, more controls and restrictions have been imposed on religious practice, boosting the power of the Communist Party and the one-party state. The authorities have targeted religious leaders, including Buddhist and Catholic leaders, as well as entire communities.